Triumph of Christianity by Tommaso Laureti (1530-1602), ceiling painting in the Sala di Constantino, Vatican Palace. Images like this one celebrate the destruction of ancient pagan culture and the victory of Christianity. Tommaso Laureti, often called Tommaso Laureti Siciliano (Palermo c. 1530 — 22 September 1602), was a Sicilian painter who trained in the atelier of the aged Sebastiano del Piombo and worked in Bologna and, from 1582, for papal patrons in Rome in a Michelangelo-inspired style with special skill in illusionistic perspective that in his Roman work avoided all but traces of Mannerism (Freedberg 1993:654). 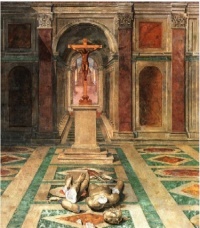 In the Vatican he was commissioned by Gregory XIII to execute a series of frescoes on a post-Council of Trent triumphalist theme, The Triumph of the Christian religion on the new vaulted ceiling of the Sala di Costantino or Hall of Constantine, where the walls had been frescoed by the school of Raphael earlier in the century. The ceiling was completed under the pontificate of Sixtus V, whose armorial devices were introduced into the frieze. The rigorous illusionistic perspectives represent a lifetime's fascination with the art of perspective. Unless indicated otherwise, the text in this article is either based on Wikipedia article "Tommaso Laureti" or another language Wikipedia page thereof used under the terms of the GNU Free Documentation License; or on original research by Jahsonic and friends. See Art and Popular Culture's copyright notice. This page was last modified 10:01, 13 November 2011. This page has been accessed 1,865 times.